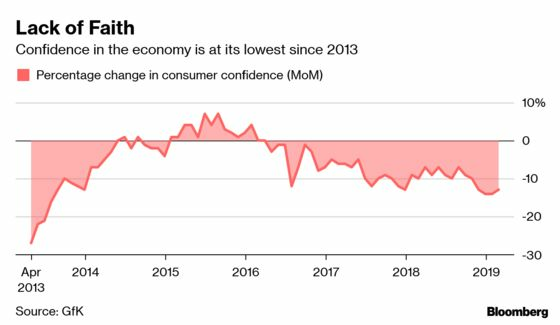 Stores are closing daily on the U.K.’s shopping streets in a crisis reminiscent of the U.S. retail apocalypse, and there’s no sign of a bottom. The latest casualties include Kate Middleton’s fashion favorite L.K. Bennett, cake baker Patisserie Valerie and entertainment retailer HMV, which has collapsed into insolvency twice. Department-store chain Debenhams Plc is shutting dozens of outlets as it fights billionaire Mike Ashley’s bid for management control. Rival House of Fraser is shrinking after being rescued by the tycoon last year. With e-commerce giant Amazon.com Inc. luring shoppers away from physical stores, the Brexit deadline looming and discounters piling pressure on mainstream grocers, there’s no relief on the horizon. 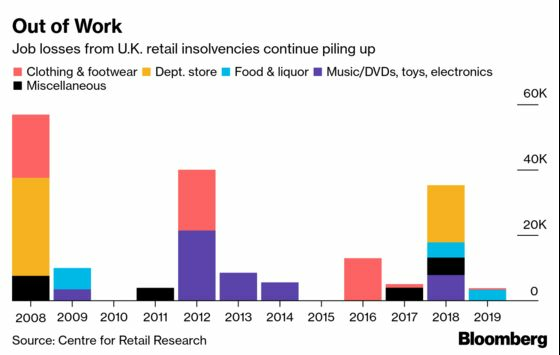 Insolvencies have jumped by more than a fifth since 2016, with more than 1,200 retailers collapsing last year. 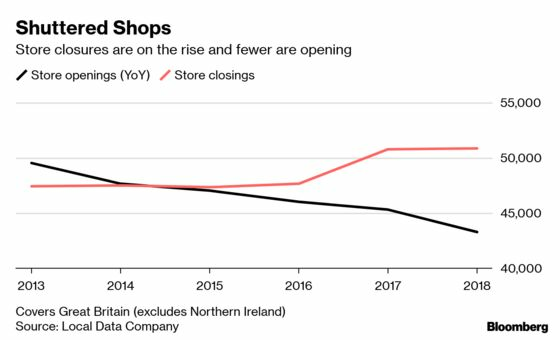 The U.K.’s shopping streets have been transformed over the last decade, with household names replaced by cafes, tattoo parlors, charity shops or just empty storefronts. Department-store owner BHS, electronics chain Maplin and the U.K. arm of Toys “R” Us Inc. have disappeared. 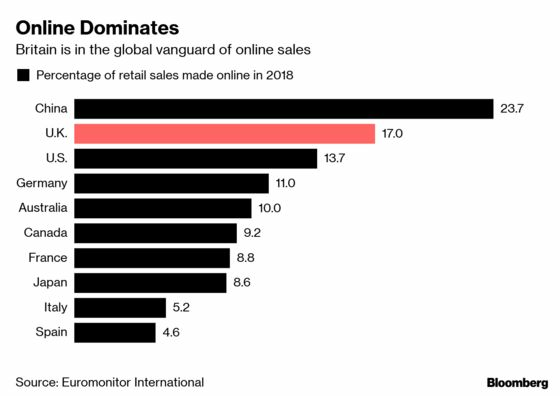 One reason U.K. stores are suffering so badly is the growth of e-commerce, where the country is one of the global leaders. With 17 percent of retail sales occurring online, Britain is well ahead of the U.S. and other European countries. Amazon is expanding its presence, while U.K.-based fashion retailers Boohoo Group Plc and Asos Plc are giving bricks-and-mortar stores homegrown competition. They’re not necessarily safe from setbacks, though; Asos issued a profit warning in December, sending its shares tumbling 43 percent, and fell anew on Tuesday after reporting weaker-than-expected sales growth. 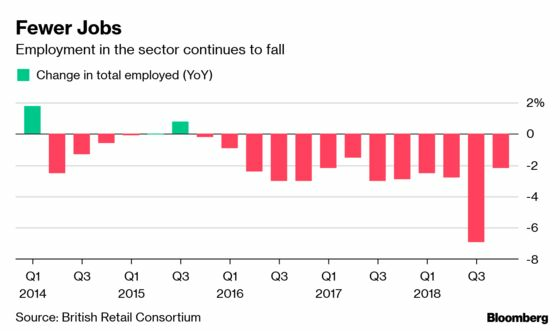 Even store owners in a solid financial position are reducing employment. The country’s biggest retailer, Tesco Plc, plans to cut as many as 9,000 jobs this year. Food and apparel chain Marks & Spencer Group Plc is closing 100 stores, costing thousands of jobs. 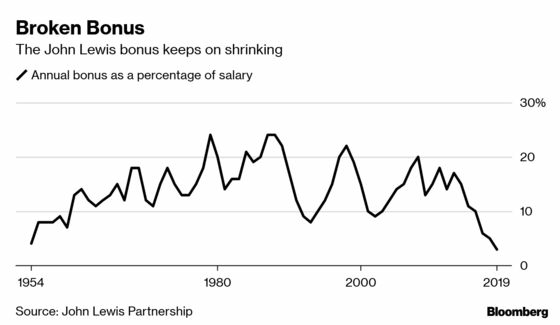 Department-store and supermarket operator John Lewis Partnership Plc has cut workers’ bonuses -- considered a benchmark of the country’s economic health -- to the lowest level since 1953, when Britain was rationing amid a postwar economic slump. The employee-owned company, which includes grocer Waitrose, saw its profit fall 45 percent last year.